Vocabulary plays a special role on cognitive skills tests, standardized tests, and academics. This skill stands alone. For starters, the author of the COGAT said in one of his research papers that a simple vocabulary test has about 75% of the predictive power of a cognitive skills test in identifying academic performers. Since 66% of the test is math and spacial diagrams, that's saying a lot. The authors of Welcome To Your Child's Brain report that a child who lives in a house full of words at age two is going to be a stronger reader and do better academically. I wish I discovered that before my youngest turned 3. I found these two gems doing early research 5 years ago. Within weeks, we started three initiatives: Vocabulary Workshop, the Word Board, and intermittent discussion of vocabulary words (to make up for oversights at age two on behalf of the parent.) For the 3.9 year old, we started phonics as a precursor to Vocabulary Workshop. Based on what I found out, standard phonics didn't cut it. Math is fairly straightforward to teach at high levels. Visual spacial skills are teachable, although it takes a bit longer. The trick with both of these subjects is to teach learning and thinking, the underlying cognitive skills, and don't focus on the subject matter. How did a genius get so good at thinking? Develop a crash course or boot camp and put the other child through it. If these tests are looking for a child likely to excel in school because they've read a lot in the last 3 years, as evidenced by a big vocabulary, then more work needs to be done on the verbal side. It's hard to give your child a big vocabulary in 2 months if they haven't been reading and talking a lot for the last 2 years. I could do the same thing in math, but can you really fake verbal intelligence with a crash course? Vocabulary Workshop was a surprise not because of the words, but a surprise in the skills my kids developed doing the questions. It was a little like the SAT in that regard. This is not expected in a book for K or 1st grade. It ended up like that because some of the words did not appeal to my children, but they enjoyed doing the exercises for the challenge of it. When they hurried through just to finish, their little minds worked the hardest, and they figured out how to answer the question when they weren't sure of the words. The lesson, however, wasn't finished until they could get past the Word Board. Vocabulary was a constant throughout the year, test prep or no test prep. I like to think of the exercises as mild test prep for the verbal section, and learning new vocabulary was test prep for next year's test. In the beginning, all words went on the Word Board. A lesson was complete when the Board was clear. The Word Board also took on anything we encountered in school science or home math. Little by little, the Word Board became unnecessary. Then Vocabulary Workshop wasn't needed. They also used Wordly Wise at school ( a dry, boring version of Vocabulary Worksop), and studying for quizzes took less and less time. These weren't needed because after years of this process, when they saw a word, they got it, and that was it. If a technical word comes up in some work, and we come back to it weeks later, they remember it. The other thing that we got from the Word Board was speaking ability. They had to stand their ground in front of the Board and explain each word or it would remain on the Board. If the word was at all interesting, the definition wouldn't suffice. I needed some compare and contrast or examples to be satisfied that they know it, and this might include use of additional new vocabulary that applies, which, by the way, would also go on the Word Board. I held their feet to the fire, like a Board, as in Board of Directors, and they were the CEO of Convince Daddy, Inc. For 3 straight years. Off and on we discuss words. It's easy when reading together, it was intense during phonics (because phonics is nothing but words), and it's harder when the children read on their own. I wish I could do a word a day, but I'm not that organized. If a new word comes up, I expound and add synonyms. As far as I can tell, children have an unlimited ability to pick up new words given the opportunity. The best words include some historical, emotional, analytic or imaginative content, because they stick. My kids talked me into changing the cover of my phonics book, from it's current Graduate Phonics look to something that looks like it's for kids. It kind of is, it kind of isn't. There are 100 lessons for kids, but on the opposite page are definitions and comments for parents about the words to build the discussion. What would you tell your kid if the word "vat" appears and why would your three year old or four year old need to know vat? Maybe the parent is sleep deprived like we were and is having a hard time thinking at all during phonics, or maybe they just came from India or Northern Africa and are a bit fuzzy on American English. (From what I can tell, they're not.) Well, if you see the two comments that start this article, age 3 is the perfect time to catch up on vat and anything else you can sound out, site words, math words, and a few goofy words thrown in like "yolk" with instructions on what to do next involving an egg. It's the perfect time to catch up on a vibrant discussion. The older child went straight from phonics straight to 3rd grade science because he ended up in an accelerated program. I really wish we prepared for this ahead of time. His Word Board had at least 40 of words on it, and they were all really hard. It took me another 2 months before I realized that he had 3rd grade language as well, and then the word board fell off the wall from the weight of the sticky notes. I've heard from hundreds of parents who followed my recommendations, and all of the comments and emails were at the beginning of the process. I now take you into the future. The 3rd grader goes to theater camp each summer, and he most likely is given the lead. There's nothing special about him except his ability to memorize his and everyone else's lines on sight. Plus, he can stand his ground and give them back convincingly. Many of the words on the word board required a facial expression or a bit of acting to demonstrate, which is appropriate for a 3 or 4 year old trying to provide definitions for shock, stun, surprise, grim, frown, etc. I don't think his advantage is going to last, because there are kids who will devote much time and effort to this acting, but it's fun to see for now. The 6th grader and I are doing a special project with a 9th grade math book called memorize all of the vocabulary words before next year. I can't divulge any more at this time. We're on page 150 right now. At least once a week, I invite him to choose between math and this exercise, and he chooses science because it's easier. He will make 10 or 15 flash cards, then I'll wait a few days and quiz him. I hold the flash card, ask for a definition, and he provides one. When I try to read what he wrote on the back, he will correct me and provide a more full definition based on what snippet he read. Then I'll wait a week and quiz him to see if he really knows these words. He does. Plus, as a bonus, we're learning a bit of science. It's really interesting stuff. I think he'll enjoy it, especially since he'll have the vocab down for Day One. If I have any readers who love science, you're probably reacting with shock and horror. I would probably react this way if someone did this with advanced math. The little one and I stumbled across Tetrahedron a few weeks ago and are 2 weeks into a tangent. Tonight, I revisited Hoggie's gifted page and read some of the content on profoundly gifted kids. I don't have profoundly gifted kids. I wouldn't even call them gifted. Instead of Gifted and Talented, I would call it Capable and Effective. Same test scores, less negative side effects. I'm still put off by the article on Hoggie's page that explains why parents should do nothing to prepare their kids for an evaluation. Granted, it might take a year or more, but parents should be doing everything they can to develop these skills in their children. Writing your children off at whatever level they currently have is neglect, or maybe negligence. Ever since my son and I walked into a gifted and talented program, 2 weeks into the school year, and I found out that the kids could read at a level 2 or 3 years ahead (we were reading board books and they were reading The Hobbit), we've been in crisis mode, as in Red Alert, all hands on deck, raise the shields, prepare to go to hyperspace. I became obsessed with what other parents had been doing that resulted in their children being light years ahead. The first thing that I found was the intelligence is a myth, and the second thing that I found was that these parents were doing a lot. Other than stepping up reading, my objective wasn't to copy the parents. The really really super bright and advanced kids have really parents extreme in some way that I couldn't replicate. I just don't have the resources to create a galactic fleet of battleships, but maybe I could find a way to blow up the Death Star. If you haven't guessed already, we saw Star Wars Rogue One last night. As I watched the movie, I thought this is the story of my children and their school. You're pretty happy when you find the plans to the Death Star and send your little one in a tie fighter to blow up the COGAT, but the Empire keeps building more Death Stars every few years and the whole thing repeats itself. One of our most important secret weapons is Teach To The Test. The Test is measuring skills, and if you find out what they are and impart these skills to your children, then they do way better in school in all of their subjects and on annual standardized tests. This is especially true for the skills behind the COGAT, the NNAT, the OLSAT, the Raven, and if you really want to get crazy, the WISC and intelligence tests as well. I usually just focus on math. All of the skills are in reading, that's true, especially the process of learning to read, but when you're a rebel, it's much faster and much easier to develop these skills in math. It requires less resources. 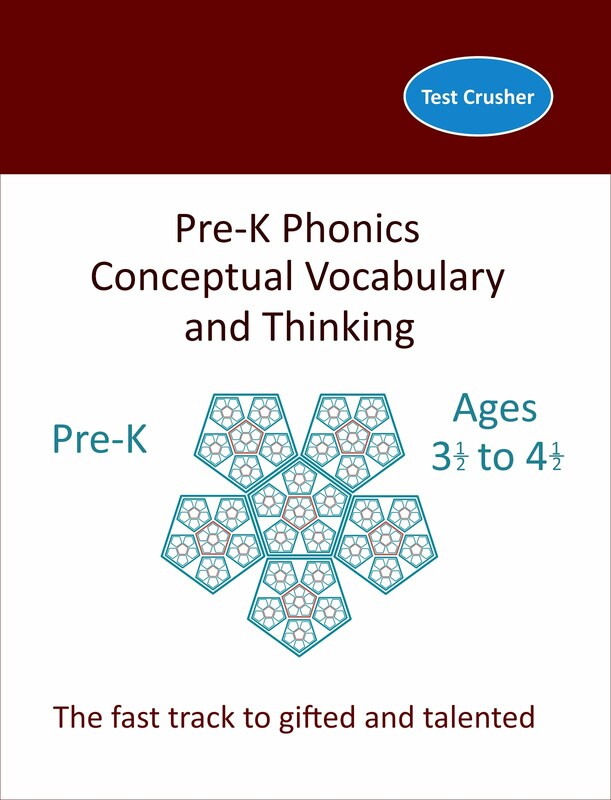 The Pre-K Phonics book focuses on these skills, but after that, it's all math. I've covered the skills up to 5th grade in articles during the last year. These are the core skills and the foundation for the higher order skills that appear in middle school. A parent crazy enough to subject their child to Test Prep Math or Revenge of Test Prep Math is going to hammer away at these skills relentlessly. The math in the books is fairly easy, just a lot of adding and subtracting with some multiplication and division thrown in, but the only way to survive a single problem is to use The Skills. My other secret weapon is that you don't learn any skills at all doing lots of easy problems at the child's level. The skills appear when you do one single ridiculously hard problem that takes a lot of time. This is also built into the math workbooks. 5 medium problems also work, although not quite as well, but when you're doing test prep and the test is in a month, you've got to cover more ground. This approach doesn't turn around a math grade from a C to an A overnight. It takes about 3 months in most situations, but as a bonus, both grades and test score go to hyperspace after that. For middle school, the bar is raised. The skills at this age can roughly be divided into a list of advance problem solving techniques for math, and a list of reading comprehension skills. On Christmas Eve, I sat down to coach middle school students and announced that we were going to work on these two sets of skills. I listed the skills for reading and provided a few examples of how these work on the SAT. My son informed he knows this list because his teacher makes them go through this exact same exercise weekly. When we started working on math, I explained the 5 problem solving skills (see my article on Poyla and the math link on the right), and again my son informed me that they already know this list and math class every Monday is a single hard problem where the kids have to apply the skills. Suddenly it dawned on me what parents were complaining about at that parent meeting I described last week when they complained that the teacher was teaching to the test. Red Alert, our secret Rebel base is being attacked by the Empire! Fortunately, I have more secret weapons in my rebel arsenal. The world's greatest math teacher (I've upgraded her from the best middle school math teacher in the country because of what I just wrote above) is no match for the World's Greatest Academic Coach, because she has 30 kids to deal with and I have one. Plus, she would get fired for yelling at a student and looking disgusted when he reads a question from an SAT book and announces that he doesn't understand the question. "Of course you don't understand the question. It's for a junior in high school. Now start reading the question to me one word at a time or I'll bring your 8 year old brother over here to show you how to do it." The 8 year old is the Darth Vader of academics, not only because he has a hot temper and no patience, but because he has a fleet of planet destroying galactic battleships. He didn't just attack the Death Star, he moved in and made the laser beam stronger. The phonics book was half of his training at age 4. I'm finishing up the other half, after sitting on it for 5 years. I'll unveil it in a few weeks. It's the plans to the Death Star. Quite a few parents in the gifted and talented programs in our area engage tutors, as do many parents who would like to turn a C in math into an A, raise test scores, and move in the direction of a GAT program. In many cases, tutors are generally a disaster and will cause irreparable damage to a child's education now and for the rest of the child's academic career. I'm not using "irreparable" lightly. I mean you're permanently condemning a child your child to a subpar academic experience. It is possible for a tutor to work magic with your child. I know a high school English teacher who is like the Yoda of tutors, but he is the exception. Let's look at the worst case scenario first, which is more common. Say your child is struggling in math. They are stumped by their homework, whether it is grade level or an accelerated program a year or two ahead. By the way, this child doesn't have a math problem, this child has a learning problem. Anyway, you get a tutor to help your child get through homework and understand the material and concepts. You hire a bright high school student who has excellent grades and is great with kids. You child is struggling with something like decimals. Your tutor knows she's hired for a reason, so she patiently explains decimals in different ways and your child does much better in school. Game over. Disaster just occurred. Forget about Stanford. Start looking at trade schools. I can't imagine any tutor, with the exception of Yoda mentioned above, diagnosing and correcting the real problem. The child doesn't need more help figuring out decimals, the child needs help to figure out how to figure out things. Being able to figure out things is why your child's peers are doing just fine in math. If your tutor is explaining things to your child, this is reinforcing your child's biggest problem, which is not figuring things out for herself. Let's try my approach. First of all, I don't care about your math grade or whether or not you can do decimals. If my goals were so miserably low, and you, my child, meets them, then where are we? We just achieved average. What a horrible place to be. So instead, here are the goals: I want you to be able to figure out super advanced math on your own, not quickly or perfectly, or even correctly, but have a reasonable understanding of something 2 years beyond you that you figured out on your own. If you can do this, then A's and high test scores will follow for the rest of your life. Most years, we're not in a situation where either current year test scores or grades matter, so we can get away with this. In years where we need an A and a high score, like GAT selection years, the only thing I do differently is current level and something more ridiculously hard, but I don't think the current level work works. However, in a GAT selection year, homework assignments must be double checked and tests must be prepared for. In non-GAT years, especially the year leading up to the test, I don't look at homework. Sometimes, I sneer at it in disgust. When we faced a year of C's in math, and you can check the archive where I bemoan this, I bought the curriculum that the child will face in two years and that's what we did. I would assign 3 pages of reading and two pages of problems. Maybe a 6th grader could do 30 problems in 30 minutes, but a forth grader with the same assignment is going to do 4 problems in 45 minutes and get them all wrong, repeatedly. Am I insane? How is a child supposed to improve by doing work he doesn't understand and frankly can't do? He's beginning to exercise the skills of a top notch student. If this child is getting a C and needs a tutor, he doesn't have these skills by definition, so it's going to be rough going at first. One poorly done problem that takes 45 minutes of struggle is worth way more than 1,000 problems that would show up in a homework assignment from school. One hard problem = learning. 1,000 doable problems = no learning. By the way, there is no good "work ahead" math material between 2nd grade and 4th grade. You can try it if you really have to, but arithmetic operations don't teach thinking. That's why I wrote the Test Prep Math books. Bad Grades + Desperation = Motivation. I don't spell this out clearly enough to parents who ask for advice about math their 2nd and 3rd grade kids. I wrote these books specifically so that I don't have to worry about an ITBS score below 99% until 5th grade. I have this recurring nightmare that people actually buy this book and my 3rd grader has to compete with a bunch of kids to get a 99%, so I'm reluctant to do any real marketing. If I had to get a tutor, maybe I have to work a lot or maybe I just stink at math or maybe my child is sick of me, then I would lay down the law by making the tutor read this article, and give the tutor next year's math or worse. If the tutor can get through the miserable experience of teaching my C student next year's math, then this just might work. As a bonus, the tutor will learn a lot as well, and maybe major in education and reform our ineffective education system. To give you an indication of how well this works, our C student is now getting A's in math, and if he ever decides that turning in homework is important, we should see A's the rest of the year. But that's just the start. He had the annual MAP test yesterday. This is a computerized standardized test. If the student answers a question correctly, the next question is from grade level plus 1, and if the student gets that question correct, the next question is from grade level plus 2, and it just keeps going. He's in six grade. I told him he better see a sin function on the test or he let me down. Last night at dinner, he asked what the word "cos" means. I nearly choked on my food. So asked what the test was like. "I got some harder questions, one which I miss read and got wrong, but didn't realize I got it wrong until the next problem. Then there were polynomials with variables, a bunch of questions that had π in them, and then this question with the word cos". If I'm not mistaken, he worked his way through high school math all the way up to trigonometry. The moral of the story is to raise the bar. Be skeptical of conventional solutions to your problems, and address the real problem. What is an Anti-Tutor? It's a tutor who doesn't help. That's the one we need. The biggest challenge in raising a gifted ear of corn from a corn kernel is managing your own feelings of impatience and frustration. It is challenging for a parent because the only way to train giftedness is to hand your child something they have never seen before that they have to figure out for themselves. This isn't the entire definition of giftedness, but it's almost the entire definition of the part of giftedness that you can teach. I really need to put this in How To Raise A Gifted Child material in book form because you have to dig through 4 other articles and take snippets from each to figure out why I just said that bolded part. Just take my word for it now or this article is going to be a stream of consciousness. Not to mention the ear of corn cob theory of giftedness that I haven't written about yet. So read the bolded text above and plod on. I spent 4 hours yesterday coaching kids in math. At the end of the day, I had a great discussion with a parent who teaches at a local university. She has complained to me in the past that university students now need a very long and detailed rubric for assignments and projects. In the old days, it would be "do this project" and the student would have to provide the vision and motivation. Now, it's "just tell me exactly what I need to do on every step to get an A." A Brazilian professor (Paulo Freire) defined the banking theory of education, one way communication between the teacher and the student, where the teacher makes deposits of knowledge into the child's knowledge bank. This is the easiest and least frustrating way to teach your child and results in very little gain. I call this Telling. My friend's goal as a professor is to make this a 2 way conversation where the student is engaged challenging and contributing to the discussion while the student works out the final knowledge product, hopefully complete with some independent thinking skills. When I explained my approach to giftedness training to this parent, I realized that I have invented something new. I'll call it the Zero Interest approach to education, where the student (The Bank) gives you an interest free credit card for 6 minutes and then steals all of your money with fees and penalties. It's one way, but from the student to the teacher. This is a worse analogy than the corncob, but I subjected her child to 2 hours of this approach, so I thought I should provide an explanation. The way it works is that I provide convoluted, incomplete problems that appear wrong, ideally with new topics, definitions, and concepts that the child hasn't seen before, and the student has to figure out everything for themselves. All the teacher does is refuse to pay their credit card bill on time by answering questions with questions. The end result is a very rich student. I call this Learning. If you're trying to figure out what this has to do with the credit card industry, then you know what the student is going through trying to understand one of my problems. In the Test Prep Math series, everything in the problem can be worked out by the student with plenty of time. I don't think grades 2-4 is the appropriate time to introduce accelerated math topics, but it's the best time to introduce thinking. If the student can master the core skills, they can then take on competitive math if they want to after they finish these books. In reality, these problems I create are extremely precise and technical. If there is a vague word, I put it there on purpose, and the child has to take one or more steps to work out the definition, or if there are 3 alternatives, work out 3 solutions and pick the best one in context. For 2 of these hours yesterday, the kids were a 6th and 7th grader. It was supposed to take 45 minutes. Even when I warned them up front, they still didn't spend enough time with the question, didn't check their solution, and made the same mistakes they make every time. This is understandable because I raise the bar each time to put them in the same position of bafflement. If they are prepared, and can answer a 5 minute question in 5 minutes, they didn't learn anything. The challenge as a parent is do endure the same mistakes and the same arguments from age 5 to 12. It's crying at age 4, whining at age 5, stalling at age 7, and arguments about why they have to endure my stupid questions at age 12. Yesterday, I had an 8 year old tell me that he doesn't know what the terms "volume" and "radical form" mean, but these were central to the questions. I don't know what "radical form" means either, although I could guess, so we looked it up. When we were preparing for the COGAT, the Zero Interest method was at work, and as we went through the practice problems, my students missed at least half of the problems. This is not just frustrating for a parent, but terrifying because the test date is approaching and the score is not approaching the cutoff. It never does with children who are level 1 to level 3 gifted. It doesn't have to. They are learning to think, and the thinking skills will probably be there by test time. If they are zooming through easy problems and getting them correct (much easier on a parent) then the parent should be terrified that they will not do well on the test. Joe had a long section of fence. He wanted to know how many bags of fertilizer he should get for his new fenced in yard. He is going to ring his yard with bushes all along the fence. If his fence is X feet long, and the yard will be 3 times as long as it is wide, and a bush needs a yard of yard to grow in, how many bags of fertilizer will Joe need? Stop reading right here and spend 30 minutes to solve this problem. If you can go through the pain of solving this problem without my hints, then you know what a child has to go through to do a problem worthy of thinking, and the pain they will feel. The goal of this exercise was to create an algebraic expression from the question. This is the math skill at their level that we are working on, in preparation for Algebra. I think I got 50 questionsand complaints on this exercise. It also has a math trick built in to guarantee the wrong answer on the first try and needs a picture and a simple numeric example to understand. Part of it is not necessary to calculate, and there are expressions that you can figure out but are misleading. We had an argument about "yard of yard", and you'll note that it doesn't say how much fertilizer a bush needs. They settled on "F". When you first go through this problem, you'll probably be looking for a numerical solution. That's because you didn't spend enough time with the problem. Then you might skip the ambiguity and some of the precise directions built into the question. You may end up with the wrong answer, not check it, and think you're done. We did this yesterday. The answer is F( X- 4 ). If you want to apply fertilizer to the grass, the grass and the bushes, or something else, feel free, but the equation will be more complicated. I've got kids who are totally unprepared for these problems spending 2 hours on a Saturday totally in the game and learning. When we started, I announced that they needed to give me 45 minutes and then they can play their PS4 game for the rest of the afternoon. They wanted to play the PS 4 and not do math. Then they were totally engaged for 2 hours. I think I'm on to something. When I say PS 4 the rest of the afternoon, I mean about 80 minutes and then I'll announce it's more math if they want that additional precious 20 minutes to finish the game. The younger child (first graduate of Test Prep Math) and I spent about an hour doing competitive math problems. I've got no other material until he's done with 4th grade. I was going to just take the year off, but in that case he would get no computer time ever because the only way to get computer time in this house is to do math. Reading doesn't count, because he has to read regardless, and music practice and chores only earn the right to do math, which is required for computer time. I love Saturdays. This house is a productivity machine. It took me at least a year to get to this point, and to get to this point, I had to learn of all of the skills of a gifted parent, which you will see published here last month and earlier (Oct 2016). In the first article in this series, I introduced the concept of giftedness from scratch. In this article, I'm going to walk through the mechanics. The subject matter has to be math. It won't work with reading, a vocabulary book, Building Thinking Skills, or a COGAT practice test. A practice test is pretty close but does not include the element of new vocabulary terms which contribute to the overall experience of finding out how ungifted your soon-to-be-gifted child is. This will happen with reading eventually, maybe 6th grade or college, but there is nothing suitable for younger children. It always happens with phonics, but you don't realize it because there's no concept of skipping ahead. Say you have a Kindergartner, a 3rd grader, or a 6th grader. Find a rigorous math book. If the math book is full of 30 Kumon style arithmetic problems per page, it's not rigorous. We need a thinker, not a calculator. The book is 2 years ahead. Your Kindergarten child will work with a 2nd grade math book. Your sixth grader is going to be doing 8th grade math, or as my 6th grader likes to call it, 8th grade math hell. The first step is to do the first page. If this goes well, speed along until it doesn't. (No child is perfect - some of them are already ahead in math.) I'm looking for the shock that the child doesn't know what to do and that it's going to take a lot of work to get the job done. The questions don't make sense. There are new concepts. Figuring out the answer - without the tools, since the child hasn't learned them yet - is impossible. Real solid life achievement, regardless of intelligence level, is summed up in that paragraph. This is after all, our long term goal as a parent. The Polio vaccine, for example, the achievements by the Mayo clinic with child cancer, discovery of the Theory of Relativity, and everything else important all started with that last paragraph. In the meantime, we need to focus our efforts on the shorter term goal of giftedness. The parent has to help at first, which is a good thing. The child needs to spend a lot of time reading the question and understanding it, trying again, not minding 5 wrong answers in a row, and being comfortable with the whole impossible process. As the parent does the work, the parent can take a long, long time, do it carefully, and get wrong answers and try again. In this way the parent can create the right expectations and environment by showing the way. I like to help because a single question can take 45 minutes when I help. I go through the question word by word, sometimes letter by letter. I look at it different ways, discuss terms, and generally spend a lot of time talking. I ask a lot of questions and ask the child to read the problem again (for the 19th time). Then we solve the problem trial-and-error, guessing and checking, backwards, in multiple ways. As side benefit to all of this is that the child becomes determined not to ask for help after that because it delays play time. Those missing math skills are a real challenge. In the 2nd grade math example, you have to add and split double digit numbers. This is a problem for a kid who just learned to count and is coming to terms with adding. I generally find a supplementary book, one that is easier, to practice a few times a week while we're getting up to speed. A side benefit of this approach is that on bad days, the child can choose which book to do, and he will always choose the easier one. My overall goal is the fundamental skills and not the math. If the child has the skills, he can teach himself anything and the sooner I won't have to help. Besides, what Kindergartner needs to know 2nd grade math? Missing skills for the 2-4 grade child are a bigger problem, because the skills you want to teach don't appear in the curriculum until middle school. In the last article in this series I mentioned that alternating between work-ahead math one year and test prep the next is a more solid approach with bigger benefits at this age. Since there is almost no test prep on the market at this age, especially at the level that I want our non-gifted children to get to, I wrote Test Prep Math Level 2 and Test Prep Math Level 3. I'm not sure you can get from grade level to more advanced math without it at this detour at this age. We couldn't. Missing skills for the 6th grader (working toward Algebra) are such a nightmare right now that I'm once again typing up exercises each week. I can find pre-algebra concept and calculation workbooks, but nothing to teach the skills of translating questions into math syntax and manipulating equations that works. Back to K. Over the next 6 weeks, there is very little progress, and you and your child are getting to the point where you will be beyond tears, whining and yelling each session. This is a big achievement. I recommend 4 sessions a week. At the K level, it is very important to do every single page, every problem per page. (This is not possible at later grades unless your child doesn't have homework.) If your child works alone, you may get 6 out of 6 wrong answers some days, and if the kid just spent 45 minutes actually trying, you won't bother asking him to do it over. You might be using the easy book once or twice a week. You might be filling in as the missing team member and doing it yourself, slowly, carefully, verbally, and getting it wrong the first few times and starting over each time. Six weeks later, the child might actually know what they are doing some of the time. You asked your child to do 2nd grade math, they just spent 12 weeks doing it, and they probably have learned the terms and concepts by now up to where they are in the book. Kids tend to learn things they do. You child has become disciplined to the fact that he isn't going to get out of it. There will still be bad days, because after all he's 5 or 6 years old, but some days he just does it. At some point after 12 weeks, the child might be working mostly alone, getting some problems correct on the first try, and getting the page done in a reasonable amount of time. For K, I recommend the two Every Day Math student journals, not just because of the approach to number sense, but also because after 5 or 6 months, the child will finish the last page of the first book. You can hand the book to your child and remind him how many times he told you "I can't do this" and then start flipping through each page. No 2nd grader does every exercise, or every page, or even most of the pages. You can state that as well. Then you can go out for ice cream to celebrate. It's a big lesson that will pay off later. By about half way through the second workbook, you might be making progress in math, but not in giftedness, because it becomes less of a challenge, so you can just shift to something else, like test prep or soccer. I wouldn't put my child through this every year. It's way too demanding. But it works for 9 months one year. I'm on pace to do this three times - K, 3/4, and 5/7. The 9 months from K became a whole year from grade 3.5 to 4.5, and we're going to need about 24 months grades 5-7 because we can only do this once or twice a week. Many school districts use the COGAT combined with a standardized test like the ITBS or SAT for entry into a GAT program. Doing math 2 years ahead is a cheaty way of getting a high score on the standardized test, and lays the ground work for a demanding At Home test prep regimen for the COGAT. As a bonus, your less-than-gifted child will be more prepared to keep up with the brainiacs that will sit next him in class should he end up in a GAT program, or be the braniac himself. When it comes to test prep, the bafflement shifts from "what does volume mean" to the arcane rules of the matrix. Everything else in the process I wrote above is pretty much the same. The problem with starting with test prep is that you've got 12 weeks to turn a raw recruit into a marine. The test prep material is expensive and there isn't that much of it. If you burn through $100 of test prep material in that 12 weeks, you won't have anything left without spending even more money (if you can find anything left to buy) to do the real learning. For grades K to 1, there is a solid year of material available for test prep, but grades 2-4, there is almost nothing challenging outside of Test Prep Math. We did the grades 2-4 curriculum before age 6, so that should give you an idea of how challenging it is. If, on the other hand, you've done nothing and the test is in 10 weeks, then I've got a completely different formula for getting over the test hurdle, but then you have to reread this article if your child passes the test, because, after all, they'll be sitting next to braniacs that actually like math. Finally, suppose you didn't know that you should do anything before the test other than a good night sleep and your child didn't get the scores necessary to get into the program. I get this question a lot. It's a completely different approach in two parts. Part 1 - a quick and grueling boot camp, followed by Part 2, which is described above. A valid way to characterize gifted children is that they learn quickly and can work ahead of grade level by 1 to 2 years. In a prior article, I suggested the three ways a child is going to get there, and in this article I'm going to suggest a fourth way called the Determined Parent. When my child was in kindergarten, I decided that it would be a good idea for him to work ahead 2 years in math. This is logically valid reasoning: Other kids can do it, China does it, and I'm looking at 2nd grade math and it's easy. I think there was a Kindergarten workbook around at the time in our house. Here's a 2nd grade math workbook of 650 problems. Do every problem. That was a 7 month nightmare. It took me a long time to refine my methodology so that it wasn't a nightmare. Looking back, teaching a non-math kid 2nd grade math thoroughly, more thoroughly than 2nd graders learn it, before 1st grade, in 7 months, part time a few nights week says something. This particular child is born to write, perhaps do stage comedy, and thinks math is as important as brushing your teeth. He became the math guy. With other one, the poster child of Test Prep, the reason I am a blog writer, we started at age 3 with figure matrices. The only reason why it wasn't a nightmare was because I already went through this once and knew what to expect. I wonder how many parents sit down with their children and determine in the first few minutes that their child is not only NOT gifted, but probably below average, and then press on anyway. Actually, I don't wonder - I just go to the gifted program and count the desks. I think I'll start charging $100 for an hour session (15 minutes with the child, 15 minutes with parent and child, and 30 minutes with the parent) to evaluate the child and recommend test prep. I'll hand the child a 10 question test and we'll spend the entire 15 minutes getting the first question wrong. Then I'll do the next question with the parent and child, another 15 minutes of wrong answer. Finally, I'll spend 30 minutes convincing the parent that the child is in fact gifted and recommending a curriculum, which you can read for free in my permanent page from the list on the upper right. If you do accelerated math at home three times - once each in K, 2-4 grade, and 5-7 grade - you can achieve Level 1 giftedness. If there's a strong reading program (mandatory), it's good for A's and (which slowly wear off). It's good for test scores on any type of test above 90%. If you alternate this math work with a year of test prep, probably because you have to, then you can get to level 2. The skills are compatible and there's a synergy at work. This will get you to Level 2, in the 95% range. If you concentrate every year on vocabulary, phonics (for the younger kids), and reading (for the older kids in case you missed phonics), you'll get to Level 3. Level 3 may or may not ever wear off. I'm sad to report that if you do this with gifted phonics in the vicinity of age 4, you'll get to Level 4 and Level 4 is most likely permanent. Level 4 is is 99.9%. 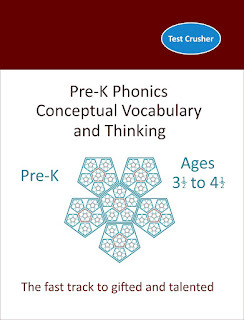 My gifted phonics book is now on Amazon, but I don't think the peak inside is available yet. If it was, you could read the 20 page introduction and find out why it's not a normal course, and why I put "The fast track to gifted and talented" on the cover. Since most of us, at least with the first child, don't know to do this, I've spent most of my time writing a blog on how to get a Level 1 kid into the GAT program (totally doable) and actually survive (much harder in my district). This is much more satisfying work and serves the common good. To get a kid to Level 4 starting at age 3 is easy, and I've provided the formula. To get a 5, 6, or 10 year old to Level 2 or 3 from scratch and stay there is a challenge worthy of years of research and 500 articles. Nonetheless, a Level 4 kid is sitting next to me right now working on some new material and demonstrating that he doesn't have a single shred of giftedness anywhere in his brain. The only difference is the material he's staring at. The bafflement and mistakes are pretty much the same every time I do this, every kid, every level. The outcome is going to be the same as well. It always is. Today is the day to apply for the options program for CPS. The deadline is December 9, which is in 2 days. If you apply today, it means that you can't use the online process and have to submit the form by mail which is a bonus because it further delays the process, and you will be totally stressed out that your letter will get lost. Why is today the day? If you applied in early October when applications are first accepted, you would normally be assigned a testing date within 2 or 3 weeks. If you apply today, even if you have to fax in your application, and call daily to make sure they got it, your child will get a testing date in late February or early March. Let me do the math for you. That's 5 months of maturity and 5 months of test prep. The scoring process accounts for differences in age in an inadequate way. It does not account for 5 extra months of test prep. 5 months of extra test prep. You can do an entire year of math in 5 months, a year of vocabulary workshop, all of the building thinking skills books (minus the verbal section), 2 practices tests, and a lot more. A reader asks what can be done in the last 10 days going into the ITBS. Most school districts use standardize test scores like the ITBS and ISAT in addition to a cognitive test like the COGAT, NNAT, OLSAT, or Raven. Since I'm late in answering this question and the clock is ticking, I'm going to forego my amusing and touching antidote that will inspire you to go on to great things with your own slightly above average child. In the case above, if the child passes the COGAT, the next step is the ITBS, so the issue is passing the ITBS after already passing the COGAT, an important context which impacts my recommendations. At first pass, this question is ridiculous. The ITBS is standardized test. It measures how much you know, as in how much you've learned in the past year. If you posted this question on the dcurbanmoms forum you would be slayed*. (There motto is "A dcurbanmom can't be too arrogant or too clueless about GAT). *Technically, the past tense of slay is slew, but the word is archaic so as I reintroduce it I'm fixing the spelling. But I've got a bit more to say than to have a good night sleep. Assuming your child isn't sick, hungry, or sleep deprived, having a good day means that they sit down, look at the test, are totally comfortable and ready to do it. It turns out that even on this point, there is more involved than getting a good night sleep and this little 5% drives the 15% and the 30%. Get a practice test, immediately, overnight shipping, and start doing it. Standardized test practice tests are typically the easiest and most lame of all tests, so get one a year ahead (for math) and 2 years ahead (for reading). The practice test helps with #4, and the advanced practice test helps with #3 and part of #2. Checking your answer is really the key. My son and I were surveying the new girls Lego sets, and I was thinking about my other son's group projects this year on a team that is usually 2 girls and 2 boys when it dawned on me that #3 should be "Work very carefully and diligently" for girls, and "Rush through the test as fast as possible like you normally do because you don't give a stuff, but do every problem a minimum of 2 times" for boys. GAT programs are filled with kids who aren't that much smarter than anyone else, but they either don't make mistakes (girls) or take the time to fix them (boys). The main reason why I stick with "Check your answer" instead of "Work Diligently" is because I work on the other end of the age spectrum, with engineers, and the ones who aren't diligent don't survive, but the ones who check their work are superstars. In the engineering environment, there's never enough time or money to check work, so it's more rare than it should be. #2 is really interesting. It is faster and cheaper and more accurate for a standardized test maker to choose questions using the practices of cognitive test makers that have "tricks" than to have a long and thorough list of questions. The test is shorter and cheaper and a better predictor of academic performance. Somewhere in my blog, I've cataloged these tricks, probably not well. I'll do it again in a year or two when we go through the process all over again. Same list, different age group. The bottom line is that the standardized tests have morphed into cognitive skills tests in the last 10 years. In the case of people who passed the standardized test, you can give your child the same advice going into the ISAT. Read the question, read all of the answers, pick your answer, check your work. Don't be tricked by the tricky test makers who are trying to get you to screw up. If your child is in K or higher, this advice will be heard and should be given. Create a speech and repeat this every time you work on the practice test. At the end of the practice test, ask your child if they did each of the points, and as you grade it together, point out which of the things they didn't do. Then give the same speech right before they go into the test and they'll be in the Zone. There is a lot of psychology behind this advice that probably requires a few articles. This article is for readers who have already passed the COGAT, so you have a leg up on the ITBS thanks to your preparation. My academic approach between ages 3 (Pre-K Phonics, the fast track to GAT) and age 10 is to focus on the cognitive skills and the standardized tests take care of themselves. If you are solely working on the ISAT or ITBS, then you need to catch up and this is going to include cognitive skills test prep. For that 50% of the test score that requires knowing stuff, how much is there to know in Kindergarten? Not much. After Kindergarten, there is a lot to worry about. In third grade, the bar starts to rise because of all of the kids working diligently to pass the standardized tests to get into GAT programs. Those already in a GAT program might see a score drop. It gets worse in 4th grade. When I was putting together the Test Prep Math series (only non-lame math questions on the market) my GAT friends and I were baffled with the test scores our supposed geniuses (aka slightly above average but a good skill set) were getting, and I made sure that the material doesn't just teach cognitive skills to meet our local cutoff score (99.8%), but also to bullet proof the scores on the standardized tests we take, which are the PARC and the MAP tests. After 4th grade, I am researching whether or not a child has to be 2 years ahead in math to get a decent score. It looks like it this might be the case. I'll say more about standardized tests in the coming month because Chicago is about to enter the first of two testing seasons, not counting the third experimental test and the forth one that my kids are subjected to. I've got a third grader who is facing stiff competition, and a six grader who is about the midway point of a 2 year season that is going to culminate in the playoffs. I think the book I'm going to write is going to be titled "If John Wooden Were An Academic Coach: The Norwood Story"*. *For those of you from the dcurbanmoms group who are annoyed that you have been accused of being arrogant by a person who just compared his academic coaching stills to John Wooden, there's a big difference between a forum that consistently tells parents that giftedness is inherited and a blog that tells parents anyone can do it with a bit of work and the right approach, especially because I'm right. I get a steady stream of really great questions from readers some to my email, but many just in the comments to random pages I've posted over the years. Someone asked about the differences between the COGAT and the NNAT, but deleted it before I could write my 3 page answer. I think covered this before because it's such a fascinating topic to insane people like me. Here's a great question about online material and about what to do if you've exhausted all the material on the market. If your child is in the unfortunate range of 2nd grade to 4th grade, you're going to exhaust the material on the market very quickly, because there is very little of it. I think the question of online material is a really good one. My child is in 1st grade and we are exploring materials for NNAT. We have completed working through a couple of NNAT prep books (smart cookie, building thinking skills level 1), but I am looking for online practice tests since the test will be online. I looked at testing mom, but getting suspicious after reading your review and also after getting multiple emails a day urging me to pay after registering with them. I looked at mathtosuccess and testpreponline websites, but confused about which one to use. Any recommendations on online NNAT testing materials? There are four reasons why I don't recommend online test prep websites. The first reason is that putting either of my sons in front of a computer is like giving them addictive drugs. They're intellects are just going to end up looking like those before and after people on websites that show the effects of crack cocaine. The key to the last 15% of the score on any type of test is concentration, patience, and checking the answer, but that submit button sits there on the screen like the devil whispering "click the mouse click the mouse click the mouse click the mouse. I'm a business consultant at a boutique IT consulting firm. All of our business consulting goes into producing websites, and everyone on staff, including me, is an IT engineer with about 25 years experience. So 5 years ago I created a website that had hundreds of really clever questions and sat my child in front of it. I even hooked up a credit card service which would not bill people automatically every month even if they asked for it because I hate sites that do that. I sat my kid down in front of our computer and watched him go through the first 100 questions. Then I printed each of these questions and forbid him from using the computer again. I am convinced that the education industry doesn't subject their own children to the material they publish. It works great for kids below the 40% mark, but to get to 99%, you have to look really hard. The second reason why I don't need to use a computer is that the NNAT book, is that after we've spent 3 months going through the NNAT book, we're at about 75% and then we can go through it again properly over the next 9 months to get to 99%. Think about that. It's actually two books, one to go through once the normal way, and one to go through it again properly. If you just bought this book and you only have two months before the test, you can read what follows and just do things right the first time with your 2 months, which could be enough anyway. My very first GAT test effort was a 2 month crash course in desperate test prep. For the second pass, I went through the book and marked all answer choices in a sloppy way so my child wouldn't know which one he marked the first time. I tried erasing but you could still see the original answer. Instead of asking for a correct answer, I asked him to explain what is going on in the problem and why the author chose the 4 possible answers to confuse him. What makes each wrong answer a good candidate for a wrong answer, and what is aspect of the problem is missing from each incorrect answer so that it is incorrect. At the end of each answer, we categorize the trick that the author used to try to make the student get the incorrect answer. This is a piece of paper with a list on it. As a bonus, you should write down the question numbers next to each trick on your list. To do things right the first time, you should not ask for an answer, but go through the 3-5 questions you are going to do that day and just ask for a description of the problem. Cover the answers. Then go back again and ask for a description of each answer choice and how it relates to each question. The go back a third time and ask for the correct answer. After a month of doing this, you can graduate to this exercise on each problem - description of the question, analysis of each answer choice, and then pick the right answer. It takes a long time (which it should because the test will), enforces the right skills, increases learning, and makes an expensive book last a long time. Which is good because there are so few books to use. The tests aren't looking for a child who is adept at NNAT or COGAT type questions. Instead the test is looking for a child who thinks through things properly. This is where my child academic skills list came from and the GAT parenting skills required to support these academic skills. The actual test, whether it's NNAT or COGAT is going to be way harder than the practice material anyway, and mastering practice questions is not a predictor of success on the actual test, but mastering the academic skills during the practicing is. The last thing we do is to take the list we created and I ask my child to create their own question for each item on the list. If the first draft stinks, and it usually does, we can refer to the list to see what question numbers were for this trick, reread these questions, and then try again. The end result is usually subpar, because I'm dealing with a 5 or 6 year old, but even in making a subpar attempt that is perhaps wrong, this child just went through a learning exercise that is way, way beyond the 99th percentile and the benefits are extraordinary. I have know of two readers who figured this out on their own without 3,000 hours of test research and one author (me) who had to figure it out the hard way. The third reason why I don't use online test prep material when I've exhausted other avenues is that an online company would have to be insane to write their questions at the proper level, which is 85% to 99%. Most of the market needs things in the range of 40% to 75% with some spoon feeding. There is no point in exposing any child to a question at the 50% level. It teaches nothing important to that child. There's no skill in doing something that a child can do. Would you make an online course for 5% of the potential market when you can make money off of the other 95%? I would not have explained in detail my full approach to test prep which I just presented above 5 years ago. If you read the articles in depth (there are now 475 of them and counting), you'd see it, but I didn't spell it out in a convenient formula. My official reason is that I don't write a lot about my experiments until I know which ones will pay off and why. This saves me the trouble of having to go back through my blog and delete articles that would steer parents in the wrong direction. My unofficial reason is that I would be nuts to subject my children to unnecessary competition from children who are way smarter and parents who read about my diabolical cheating methods. On that note, I am getting questions from readers of my 6th parenting graders peers about what to do during this super critical period of testing and grades. I don't have much to say right now, but when I'm out of the danger zone, I'm going to refer back to this article and point out that the answer was already there. It was there 5 years ago as well, but one would actually have to read my articles to see it. For the 2nd to 4th grade range, the material is so bad that I created the Test Prep Math series. As a test prep author, I felt an obligation to get a copy of everything on the market, and we exhausted everything through the six grade before my child turned 8. I really need to spend more time explaining how awesome this series is. My older child demanded that I change the cover. "Add a stick dog with brown hears, some swirly read at the head, different font sizes, and other useful stuff." I set out to create a course that hammers away at cognitive skills from about the 75% to 99.999% level. My 10 year old co-author was in charge of goofy names and making sure the questions "aren't lame". Both of these kids are now 3 years in math, a point which I didn't think was possible, especially with children who aren't especially gifted or exceptional in any way. As predicted by the COGAT author, cognitive skills are really powerful. Back to first grade. With everything I mentioned above about using test prep material, and the real skill set behind succeeding on the test (which I've covered extensively in the last few years), I found that a really great approach is to use reading comprehension books. They don't have figure matrices, obviously, but they have the exact same skill set required, and for us, they're really hard if you get material 2 years advanced, even material that the parent has to read because the material exceeds the child's reading level, and the parent has to explain word definitions for the child to get through the question. That is the forth reason why I never got around to using online courses. Reading comprehension is way better test prep, and it takes a whole session to get through one question. That's also why the questions in Test Prep math get longer and more confusing as you progress through the book. My the half way point of Level 3, the questions are downright convoluted, and both my child and I had to read the question a few times to figure out what the heck I was asking. That's the #1 skill you want your child to have going into the test. He should mistrust his first reading of the question. I also designed each question so that an incorrect answer is inevitable on the first try. I rewrote any question that my test group got correct the first time in the last half of the book. That's the #2 skill. A child should mistrust their first answer. Reading comprehension is designed specifically to require these two skills. That's where I learned it. Without these two skills, a bright student is going to miss 15% of the questions on a both a cognitive skills test and a standardized test. This exercise is so powerful, and so painful, that we only did a single question from a reading comp book (2 years ahead) every other weekend. And that is my final answer to the question above, reason #4. While Test Prep Math directly steals these aspects from reading comprehension, I wrote it so that we could do a question each day from each section. We couldn't do this with a challenging reading comprehension book. Getting through a single question from a reading comprehension book is like taking a practice test; this works every other week but not every day. If I were desperate and the test was in 10 days, we would do reading comprehension every other day or every day, but it would be painful. Also, Test Prep Math targets working memory and number sense skills, starting at a failry reasonable level and then going to a ridiculously high level in a more step-by-step, manageable approach, because, after all, a reading comprehension book is not going to help with the quantitative section. There is no Level 1 to this series, because most of my readers are not struggling at age 6 with quantitative issues and I there is good material at this age. Finally, I need to address the part of the question "because the test is online". The answer is the same if the question said "because the test is the COGAT" or "because the test is the NNAT" online or in a classroom. The last 5% of every score depends on the child being familiar with the format of the test. This has been well documented by the test authors themselves. You need a practice test, and I strongly recommend simulating a short test as close as possible to the test your child will take. I went through the more thorough answer to distinguish the practice effect from real learning (as in the real learning of the cognitive skills the test is measuring). If the test is online, you have to get an online practice test, or an online test prep service, choose 20 questions, and make it a formal practice test exercise, preferably in a class room setting with reasonable distractions. Even with practice COGAT books, this wasn't our primary learning exercise (a formal practice test session) and I don't see learning or skills improvement happening during this process, nor would I recommend doing it a lot, but the 5% is real. The study did not use really hard test questions. It's the format that helps with the 5%. Your child's performance on this practice test will not indicate how they do on the real test, and because of that, I don't think which online service you choose really matters. I just approved the publishing of the Phonics book. I think this is the first Pre-Test Prep book on the market. While the content is solid, since I spent 5 years on it, I still need to work on the cover. My kids hate it. I designed it to look like my favorite abstract math books from graduate school, the ones that really motivated me, because at the end of the day this is what it's all about for their future. My oldest son said I need a mascot like a yellow stick dog with brown ears, not to mention brighter more cheery colors. I told him the only way a stick dog is going to appear on this cover is if he is driving a bulldozer over thousands of words. He's not impressed with the fractal which is a visual representation of the word links I saw when I wrote a computer program to organize all words that are 6 letters or less so I could verify that the ones that I had been using had the highest cognitive load. If I run out of other projects, I'll fix the cover. The book won't be on Amazon for about a week, and then it will take another week for the search terms to kick in, and the first edition is probably going to contain a few typos despite 5 months of review and testing. If you are desperate, and can't wait for Amazon, you can order a copy from here. There is so much in this book that its going to take me many months to explain it. The main premise is to be the fastest, easiest way to get into a GAT program, provided that a parent follows up phonics with the requisite test prep. But that's just the beginning, because, after all, if your child gets into a GAT program, you still have to survive it and then excel. The oldest one is gearing up for 7th grade. This is the year of mandatory straight A's and 99% test scores on multiple tests to get into high school. We've already made a lot of progress gearing up for math, writing and language appears to be going well (and when you see this book, you will understand why), so I thought I would turn my attention to Chemistry. Next year, the kids will be studying 9th grade Chemistry. I bought the book best book I could find, handed it to my son, and asked him to make a flash card of every bolded word in the book, with a definition on the back. In the first 100 pages (950 more to go), he created 80 flash cards which we've been refining and trying to understand. Is it too much to ask of an 11 year old to memorize a thousand technical 9th grade Chemistry words in his spare time? Pre-K Phonics introduces the Word Board in all its glory to navigate the vocabulary words in the phonics lessons. We continued to use the Word Board with Vocabulary Workshop for a few years afterwards, until my children mastered the process of mastering vocabulary. Our flash cards for Chemistry include not only definitions, but whatever else we think is important to understanding a word without going deep into the material. He doesn't need to look at the flash cards but a few times to get a basic understanding of each word. He won't know 9th grade Chemistry by the time he sees it in school next year, but he'll have all of the words, definitions, and concepts ready to go so that when he does see it, he can spend more time with "Aha" and less time with "What". I call this ready to learn. It's the exact same process we started in Pre-K all over again, and it's build into the book. After two years of coming into work at 4 am to write a phonics book, I finally sent the manuscript to the publisher. Big expectations required big work. Unless something is messed up, it should be available this week. I'm not crazy about the introduction, which includes a parenting manual, because I had to cut 50 pages in order to make the cost of the book less than it's price. It's not so much of a phonics book than a complete change in lifestyle from slightly above average to super duper gifted. When I created this course in 2011, I was knee deep in reverse engineering the cognitive skills test, and was haunted by something that the test author wrote in one of his papers. In 1911 (or around there) E.L. Thorndike pointed out that all of the cognitive skills - the whole skill set - is active during the process of learning to read. The child will over course continue to develop these skills over the course of their academic careers, but activities like math and reading comprehension are going to use a subset of skills. Learning to read has the whole list. Reading comprehension and math combined comes pretty close, which is why the Test Prep Math series looks like reading insanity and math combined, which it is. Of course, there's a bit more work that needs to be done to get into a GAT program if the bar is 99.8%, which it is in Chicago, but proper training during phonics is such a huge advantage that it's possible a child who excels during phonics will have a permanent advantage. I've spent most of my research hours devising ways for a child with no advantages at all to close the gap, with lots of success. It's possible by high school to close the gap permanently, but between age 3 and age 15, I don't think it can ever fully be closed. I've hinted at this in prior articles, but I've been reluctant to write about this extensively because most of us didn't think to start the work during phonics, and without putting the material on the market it's somewhat unfair of me to mention it. In the introduction, I outline some of the parenting skills needed during phonics. It's a small list compared to test prep. One of the featured parenting skills, probably the most important, is Zero Expectations. I'm amused at my own advice, to maintain Zero Expectations, when the whole point of the phonics course is to get a child from 0 to the 99th percentile. I expect you to get through this ridiculously ambitious workbook even through you obviously aren't the slightest bit prepared for reading and have none of the skills needed. The first lesson takes 45 minutes to 2 days, and you got everything wrong, but we're just going to keep going. As a parent, I'm willing to suffer through an abysmal performance over the next 4 to 6 months and viola: my child 2 years ahead in not only this material, but a host of other skills as well. This has been my experience on just about every academic project we've undertaken. We've been doing some ridiculously ambitious projects at the 8 and 11 year level and it's the phonics experience all over again. What's really cool is that it's the same core skills again. I'm going to write about these next month in more detail, but some of the key ones emerged during phonics and were extended over the next few years, and we're still successfully using them. I wanted to name the book "Gifted and Talented Phonics", but this would confuse people in thinking that the book is for gifted and talented children, which it is not, instead of children who aren't gifted and talented but will be by the time they get through the course, which it is. The one secret that I know as a parent is that all kids learn how to read, although phonics helps a lot. But, assuming they all learn to read, what else can be done during this period to take advantage of the 6 months spent sounding out words, especially if there is a GAT test in their future? It turns out a lot can be done, and that's what this book is about. I'm taking a break from parenting skills to address child skills. I think in the next few years I'm going to have to rewrite both of these topics twice. There's no way I'll articulate this properly the first time, even though 90% of my research is focused on identifying the skill set a child needs to succeed at the right level (which is pretty high for all children), and the parenting skills are just those skills I've identified to make this happen. When I first started doing this, I had about half of the child skills down and no parenting skills. When you read the description of these skills, and how to get them, you might think that you've fallen short as a parent. If you would have done this right starting at about age 3, your child would be in the 99.9% and test prep would be a waste of time. The good news is that it's never too late to catch up. Never. In the future, when I talk about cognitive skills in other contexts like math, what I'm going to be talking about is my efforts to catch up. I'm starting with reading because I do almost nothing in terms of reading skills, since reading a lot and vocab workshop have been mandatory in our house since age 4. Plus, a month ago I banned all video games for the 10th time, and it's been 30 days of reading out of boredom. As I mentioned previously, when a child learns to read all 1,529 subskills are used. Obviously, these skills don't develop to their full, more advanced level, but they are all there. 1. I see all the letters and problem decomposition begins. 2. There's a rule that needs to be applied from an example. 3. I need to take 3 or 4 of these letters and group them. 4. Then there is the ight to deal with. 6. So I said b-r-igh-t, and that doesn't really sound like a word because of the pauses. 7. OK, what does this mean? It rhymes with light, but also night, which are opposites, so that doesn't help. But it sounds cheery and happy, not a sad word like pout or dour. Br words are like breakfast or bring, but also broken. I give up. 8. If this is in a book with a picture, then context helps. 9. There are more skills here, I'm not an expert. I don't spend much time with this activity. The first time I saw #7 in action, I was doing test prep with a 5 year old who is the daughter of my Reading Nemeses who live 3 blocks north of me. They have 4,000 books in what's left of their family room. If I overhear something like "I missed 2 questions on that test" or "I forgot to turn in my homework", I think "Good, it serves you right for evolving into some super intelligent being." Anyway, I was using a 3rd or 4th grade reading comprehension book and she kept getting answers right even though she didn't know what any of the words meant and couldn't follow the passage, so I finally asked how she figured out what the words meant. She explained #7 above, very articulately. Curse you Reading Nemeses. For the rest of us normal humans, my advice is to start your child reading as soon as possible, because I'm afraid if they start reading later, they won't have to do all of this thinking and miss out on building that cognitive skill set and then you have to buy Test Prep Math in 2nd grade to fill in the gaps. If you want to know why my math questions are so convoluted, now you know why. Trying to catch up. After learning to read, the next big step is to learn vocabulary. My favorite skill during this phase is to see things that others don't see because the child has a word for it and can acknowledge it's existence. The best example is to see the word wide as opposed to just see big. The COGAT practice tests usually have this example in the figure matrices. The list of interesting words "to see" is about 2,000 words long. I'll say more about this list in the next month. Something big is coming. Something really big. But you have to wait. Seeing is almost a core skill, the kind I focus on, like taking a long time to do something or trying again. I should officially add this to my list. If you see things, then this opens the door to more thinking. Take the word lobby. An interesting word. What's the difference between a lobby, a foyer, and a vestibule? When we came across this word during phonics, we took a field trip through our neighborhood walking up to each building to see if it was a lobby, a vestibule, or a foyer. I don't have room to write out all of the differences and similarities, but again, it exercises many cognitive sub skills. During this stage, working memory develops naturally during reading. The more reading the better. This is the age where memory develops. Like working memory, it's not exactly a core skill, and it's not a subskill. A basketball player has core skills like motivation and determination, and subskills like accuracy and fancy moves. But he or she also has physical strength and endurance, and a big set of lungs. Anyway, during this phase, with reading, the goal is to pack the brain with as much information as possible, and then pack it with some more. This is a fun time to be a parent. You get to tell your kids stuff nonstop. I have another theme in Academic Coaching, which is to start working on skills for the next level. Many parents do the opposite, which is to keep doing what they've been doing all along without realizing that the level changed. The result is an academic train wreck. In this case, to avoid the train wreck, at about age 9 start asking questions. My favorite questions are not answerable, like "What is this character doing? Why are they doing it? How is this book going to end?" I've experimented with comparisons, like "How is a wizard in Harry Potter like a wizard in Lord of the Rings" but this doesn't seem to be panning out yet. Maybe this is a level 5 skill. The skill bar is raised. Telling is over. Of course, telling was over in math at age 4, and ironically, I find telling making a surprise reappearance in math at this age. The first skill that I've identified at this age is for the child to see clues in a story. The author introduces something or mentions something, usually in a clunky, contrived way. Even the best authors use clunkiness. Many kids don't even realize that they are looking for clues. The related skill is to solve the mystery. Where is this book going? There are a lot of mystery stories on the market for little kids, but most don't seem to realize that every book is a mystery, even Captain Underpants. This book is going somewhere, and if it's written properly, it is going to be a surprise. The best way to enjoy the book (assuming memory is developed), is to count the markers on the way and build expectations while trying to put all of the facts together. If you think about this, success in life and science and other fields is dependent on this skill. The "solve a mystery" takes the basic subskills I already listed and applies these widely to people, places, activities, but at this stage, usually not emotions. Well, this is where I am now. I can see things in 6-8th grade reading evaluating emotion, motivation, and everything else. Not sure where the bar is. My goal at this age is to start bowing out as an academic coach anyway, just going back to the cores skills and grit and letting my child take over the detail work. I guess that is where the bar is raised on a parent. The very first insane thing I ever did as a parent was to hand my 5 year old the Every Day Math workbook #1 and ask him to do every problem on every page. This was his introduction to math. Once I found out about the concept of "test prep", I raised the bar further with ridiculously complicated problems that take an hour to figure out what the question is asking. Since then, he's done a steady stream of impossible tasks that take many months to complete, and at the end, he sees the results and I remind him of all the hard work he put into it. In past articles, I've outlined most of the parenting skills that are required to pull this off, and now I'm ready to talk about the biggest skill of all, which is to expect really big things of your child that take many months. I could stop here, but you and I are probably wondering what is the long term outcome of this approach? What is going to happen to your child if you exercise the Mother of All GAT skills? What happens if your child doesn't attend a GAT program and you do this anyway? Last weekend, I compared a 6th grade child in a GAT program and who is currently being subject to 9th grade insanity at home, to a 7th grader who is working at grade level and does nothing special but go to swimming practice 3 times a week. I did this because lately I've been researching how the skill bar changes over time so when this friend came over to play video games, I announced that they needed to do math first. And then run 2 miles. First, let's take the GAT kid. In Chicago, 7th grade is an important year, where grades and test scores determine high school enrollment. At the end of 5th grade, we started stepping through the 7th grade math curriculum, which is an 8th grade book. I think we're going to finish. For the last month, I've asked him to write down every thing relevant to linear, exponential, inverse, and polynomial functions, which will take him about 6 weeks. Last weekend, I bought the 7th grade Chemistry book, which is a 9th grade textbook, and we're going to memorize all of the vocabulary and concepts in the next 6th months. Given his training in doing ridiculously impossible tasks, not to mention the years at the Word Board, I think this is doable. I'm even more pleased with his ability to perform on non-academic exercises. If you've seen Test Prep math, you might wonder where the characters Jeffrey Sincomhoff and Sumi Von Gusa came from. My son wrote many of the questions, and I added the math. Most of the main characters are his classmates, including the hapless Yani and his evil nemesis Mallory. Mallory sat on the student counsel with my son in the second grade. In case Mallory should happen across this blog, let me state for the record that she is not evil, even if she has all of the qualifications of a nemesis, including turning in her assignments on time, which is a skill that my son lacks out of sheer lack of caring, which is why I bought the 9th grade Chemistry book. Now take the 7th grader. I announced that the 7th grade non-GAT grade level friend would learn about linear functions in 30 minutes or less (which took 75 minutes). I showed him y = mx + b, and to be on the safe side, y = 3x + 2. He had no idea what "y" was supposed to mean, let alone the rest of it. He wasn't lacking any of the core skills. Didn't care a bit that he was totally baffled and happily redid his graphs when I pointed out discontinuity in his line. I was really disappointed. I asked my 8 year old to come over and show this kid how these functions worked. My 8 year old happily obliged, because he thinks he knows everything and is fearless, and proceeded to get things mostly wrong as well. The 7th grader was not the slightest bit annoyed. I was hoping for tears. I need more time to prepare. I told him to come back next week and I won't be as easy. I'm going to give my 8 year old all of the answers first, and I'll jump right into exponents in the middle of the lesson for no reason. A few days later, my 6th grader and I walked to this friend's house. His parents told me that their child was so excited about our session that he called his parents on the way home to tell them that he had so much fun and is now doing math at Mr. Norwood's house on Saturdays. I know exactly what is going to happen in the next few years. It's been happening in our neighborhood for the last 15 years. This is an odd chummy neighborhood, with about 2,000 close knit families. I haven't exactly been charting outcomes, but I could go up and down the blocks listing off who went where and why. This has always been central to my research; parents are more than happy to talk at length about their children, and I'm more than happy to ask. The 7th grade swimmer will get into a good high school, probably with little effort, although I'm raising the bar dramatically after last weekend. My son will get into a good high school with a lot of effort, because his classes are ten times as hard and his classmates are all brainiacs. My personal goal is to get him into the 50th percentile of his class, which will be good enough. Then in high school, all of the GAT kids will be a year or more ahead. Some of the non-GAT kids will take summer school in a few classes like math and catch up with a little effort. They will go to similar colleges based on their own goals, and do great things that may or may not be academic in nature. I could list off young college graduates and their accomplishments, and ask you which ones attended a grade school GAT program and which didn't. You would answer incorrectly most of the time. Then there is child #2 who isn't part of my "how to be an effective parent" research program but simply takes advantage of the results which I've been publishing here for the last 5 years. Last weekend, he found the instructions to a lego Star Wars set that we haven't seen in 18 months. He glanced at the materials list and tossed the book aside. I sat their in stunned silence while he picked all of the the correct parts our of our bins of 70,000 legos, built the thing from memory, and then changed it to make it bigger and better. The story isn't written yet for this case. He'll be doing powers and linear functions today as well. Test time is upon us. It's time to start thinking about what you are going to say to your child after you drive them to the testing center. A better time to start thinking about this is last month, but better late than never. I'm moving Skill #7 to the head of the line. When I first started research GAT tests, the best advice I found for going into the test was to tell the child, "This test is going to be like puzzles and it should be fun. If you answer every question on the test, after we leave we'll go to the toy store and I'll buy you a toy." At the time, it seemed like sound advice in context, if the context is a little bit of test prep, a good night sleep, and a parent who is totally freaked out by the whole processes and needs something to say so that they don't send their child into the test room feeling the same terror that the parent is going to feel watching the child go in. Oh, there will be terror. It's worse than terror. It's horror. Any parent who tells you that they just let their child go in hoping for the best with no pressure is completely lying to themselves and you should never trust this person again. If this were a sporting event, I would be thinking "I hope you lose. At least you would learn something required for later success in life, and it would be fitting payback for me having to drive your sorry carcass somewhere on a Saturday. Who's dumb idea was it to start sports for little kids?" I've actually said this before. But this is the test. If your child somehow passes this test, they will be in a top notch academic program, and regardless of their poor intelligence and lack of qualifications, they will emerge years later in the ranks of the gifted. That's the dirty little secret of GAT tests - they are great predictors of academic success because GAT programs do all the work. It's like winning the Lotto is a predictor of wealth. The other secret is that your child's classmates will probably come from families that do advanced math during breakfast just for fun and calculate exponents on their cheerios, but that is the topic of GAT Parenting Skill #8. During the process of test prep, your child is building cognitive skills, being exposed to a lot more vocabulary, and having lots of conversations with the parent that slowly develop into more adult conversations. It occurred to me that I could use this new level of thinking skills to get my child to understand what was at stake and to take it seriously. Equally important, there's the issue of the repeated mistakes that resulted in a consistent 50% or less on practice questions going into the test. These include not reading the question carefully, picking the first choice as the answer without looking at the other answer choices, doing the opposite of the instructions for classification problems (he liked to pick the most unusual item from the list instead of the one that doesn't share the primary characteristic of the others), and giving up when he's stuck on a hard problem. We didn't talk on the way to the test center for our second attempt. I asked him to read. The prior year was a complete disaster. I signed up for the test too early, with a young four year old in the 99% of shyness, who was terrified of animals and people, and I was a nervous wreck. He was shy of a passing score, and I'm sure it was because he spent more time trying to figure out how to get out of the testing torture room than how to answer questions correctly. When he came out, he told me of the question and answer choices on the question he got wrong. This was a one-on-one test. The proctor asked informed him that he was wrong and asked him if he wanted to try again. This is apparently part of the test, and if you read my books or articles on cognitive skills for kids, you know why. He answered, "No, I don't want to try again." I was devastated. We didn't talk the whole way to the toy store, nor on the way to the bookstore that I drove to afterward to start the process again. The next year was a bit different. In the test center, the MC announced that children with the yellow tickets need to line up. This test was for 1st grade, which is the entry year for my other son's school and our target. I couldn't have done anything with a passing score the prior year, but the experience still left me with a profound sense of determination. Other parents stood up with their children and said things like "have fun with the puzzles" and "no matter how you do is OK with me". After the parents and their children left their seats for the line, I said, It's time to do it. You're ready. You are going to crush this test. A lot is riding on each and every question, and if you screw up, you can't go to school with your brother. From prior experience, I knew that the lining up process would take a while. When it was his brother's turn, we showed up to watch the line going into the room and after a bit of franticness, it worked out OK. So I continued, Don't answer a question until you've looked at it long enough to figure out whether or not it is trying to trick you. All the questions are trying to trick you. Read them all twice. Don't answer a question until you look at each answer first. Repeat that back to me. Check your answers. Then as the line looked like it was about to move, after the third call, I asked, What do you do when you get stuck? He replied, "Shape Size Color Count", and off he went. Before I explain how to pull this off, and why, let me mention two other things. After we signed in at the test center, way too early, we wandered around looking for vending machines for a pre test snack and tried to get on one of the public computers to waste time. "Waste time" does not refer to my child not worrying, but me. Plus, I had to gear up for my speech and try distract my son from my nervous and pensive behavior. On the way home in the car, he thoroughly explained the number, content, and difficulty level of each section. At home, he began drawing question and answer sets, providing commentary as he went. The test is administered by the psychology department of a local school, and they have this brain wiping trick in the form of a scented sticker that each kid gets after the test. I have my own brain restoring tricks, plus my son had developed a powerful memory during our time at the Word Board. Back to the speech. It has 3 parts, as you can see above. The first part was my preamble about how important this is and how I expect him to do well. I probably blew it, but I could at least try because we spent the last few months (well, years, but months should be enough) working side by side on a big long term project. He knew for months that he would earn a trip to the toy department but didn't really care, because the team and the project were much more important to him at this point, not to mention my confidence in him and his big role, plus the passing of the baton, the legacy, and whatever else. Thanks to billions of dollars spent on psychology, the army already knows this and I was just copying what they do. The second part was the rules of the game. How many times did I tell him to reread the question, look at all of the answer choices first, and check his answer? Maybe 10,000 times. A child who has these skills drummed into their behavior will perform at the 99% level eventually regardless of their actual level. After another year of continuing to repeat these rules, and coincidentally being disgusted with the boringness and lameness of math curriculum, I wrote the Test Prep Math series to drum these skills in to all kids with a sledge hammer. I was able to brief him on the rules again and expect him to take these rules into the test because they had become part of his training, even if he chose to ignore them most of the time. That's why I gave a preamble. The preamble let him know that now's the time to use them. The third part was pure genius, and the reason why I won Competitive Parent Magazine's Competitive Parent of the Year Award (known as the Compettie) in 2012. One of the most important skills in all advanced subjects is to look at a problem from different angles or viewpoints, and one of the best ways to do this is to step back from the problem. Getting stuck ends the process and results in frustration. It prevents the back part of the brain from tossing out suggestions and ideas. It has been proven by research that the back part of the brain contains 95% of the thinking power of the brain and if the front part would just shut up for a minute, the back part will give it the answer. At first, I just noted that the key to shape, size, color, count was usually the answer to practice problems in both the verbal and the figure sections of the test. Of course, the real test is much more complicated. About a month before the test, in exasperation, I started saying "Shape Size Color Count" all of the time during practice and made my son memorize it under the head of "What do you say when you get stuck?" What I actually did was give him a mechanism to address being stuck whereas before, his only response was frustration, impatience, and more stuckness. I'm not sure he was able to use "Shape Size Color Count" to correctly answer a question that involved shape, size, color, or count. I asked him after the test how many times he resorted to "Shape Size Color Count". He responded two or three. That means that he was stuck two or three times, and got unstuck. I don't remember what the questions were, but I remember thinking that I succeeded but not in the way I thought I would. The funny thing about high level cognitive skills is that they can be learned at any age, including my age, which is about 115 years old. In this case, the problem is "What to say to your child on the way into the test", and if you spend a bit of time on the question and the answer choices, you'll see the answer. If you get stuck, say "Shape Size Color Count" and try again.